Celebrate the Big 5-0 with these "50" Paper Lanterns. Turning 50 is a milestone in life, be sure to treat it as such by adding a bit of style. 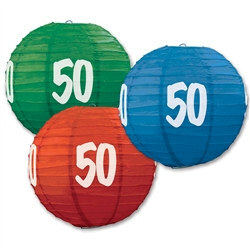 These 50th Paper Lanterns come in assorted colors of blue, green, and red with the number 50 displayed on each. When completely opened the paper lanterns measure 9.5 inches and look amazing surrounded by a Happy 50th Birthday Sign Banner and 50th Tablecover. Quality and delivery time exactly as expected. A little hard to hang.